(NaturalNews) It is safe to say that virtually all Americans want clean air and clean water, but at the same time, they also want any government-run effort to obtain these goals to be realistic and frugal. Tax money, as the annual budget deficits of the last decades have proven, is finite. So, when government gets involved in a "green" project that costs millions of dollars, shouldn't it at least be functional? Most reasonable people would say yes. Sadly, however, we are indeed talking about American government, a costly behemoth that is the epitome of waste, fraud and abuse. One of the latest examples of green waste comes via the Department of Veterans Affairs, which spent $2.3 million in federal "stimulus" money (remember TARP?) at its hospital in St. Cloud, Minn., on a mandated project that has not been operable for months. A 600-kilowatt wind turbine -- some 245 foot tall -- stands on the wintry VA grounds, frozen in time and temperature, essentially inoperable for the past 1 1/2 years. No one is working to fix it, though many attempts were made to repair the turbine, once billed as a model green energy project. "The St. Cloud VA is a hospital, and our focus is on our patients and we like to think that we treat our veterans very well here," said Barry Venable, a public affairs officer for the VA in St. Cloud. "We're embarrassed that this turbine does not operate as advertised." That is much different than the build-up for the project in December 2009, when officials announced plans to construct the turbine - the only Veterans Affairs project included in a White House document praising President Obama's executive order for federal agencies to lead the way in renewable energy. "Throughout the Federal Government, agencies are already leading by example toward building a clean energy economy. This document outlines some examples of projects, many of which leverage Recovery Act funding, that will drive long-term savings, build local market capacity, and create new private-sector clean energy jobs," states Executive Order 12514 and called, "Agencies Leading by Example." Today, however, critics of the turbine have a completely different narrative; they say it is emblematic of the overall failure of federal stimulus (read: taxpayer) spending on renewable energy initiatives. "It's another example of stimulus money going after bad projects that make no economic sense. The VA in St. Cloud shouldn't be in the electricity business," said Peter Nelson, director of public policy at the Center of the American Experiment. "We already have utilities in Minnesota who are in the utilities business who know the best areas in Minnesota for setting up wind turbines and know how to maintain them." He's right. This author has traveled through parts of Minnesota and has seen vast stretches of countryside filled with operable turbines. Studies done before construction suggested St. Cloud's winds could produce up to 16 percent of the VA hospital's electrical needs, potentially saving about $100,000 on the government's annual utility bill. The facility consumes 1.3 million kilowatt hours of power, at a cost of $1.1 million per year. At a savings of just $100,000 a year, that means it will take 23 years of operation before paying for itself - and that's if it does not require any maintenance or repair (which is unlikely). Was it a failure of one project or an overly broad government mandate? Also, as an alert reader of the Watchdog.org post pointed out, according to the figures supplied in the report, the St. Cloud VA hospital is paying around 85 cents per kilowatt hour, though the commercial rate is advertised at just 7.6 cents per kilowatt hour (as indicated here). 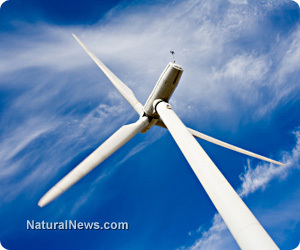 In the interest of fairness, while Obama wrote his executive order, the VA wind turbine project was an attempt to comply with a 2005 law mandating federal agencies generate 7.5 percent of their power through renewable energy sources by 2013. That means the law was written by a Republican-led Congress and signed by a Republican president, George W. Bush. In the end, it is just another mandate that hasn't panned out as planned.